Who can decipher this encryped telegram from 1948? 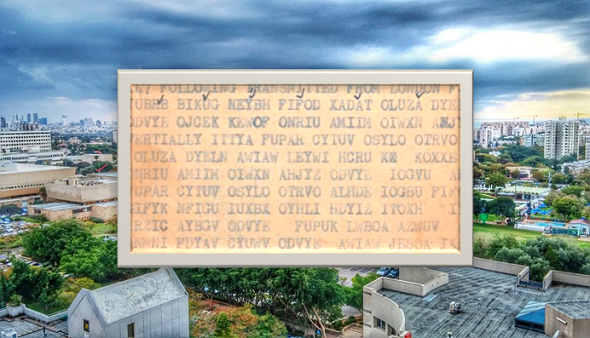 In 1948 an encrypted telegram was sent from New York to Tel Aviv, Israel. Can a reader break this encryption? Blog reader Dr. Karsten Hansky has provided me a very interesting document he has recently aquired. 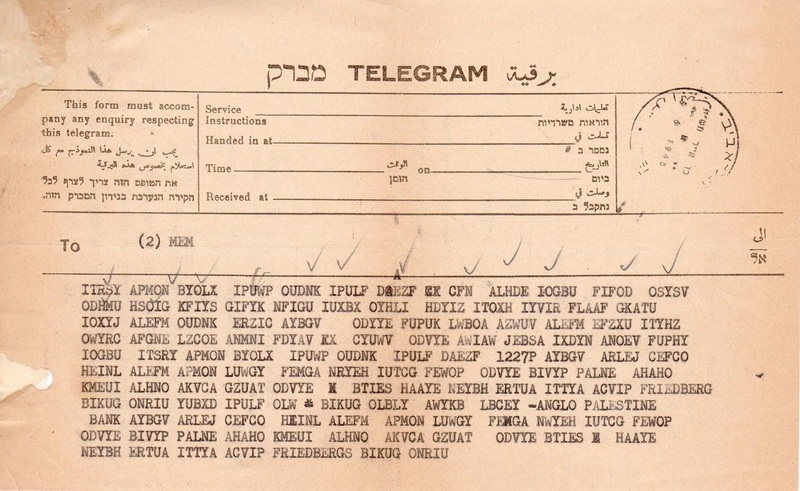 It is an encrypted telegram that was sent from New York via London to Tel Aviv on June 5, 1948. The recipient mentioned on the telegram form is GOVTT MEMISRAEL TEL AVIV, which probably stands for the government of Israel. 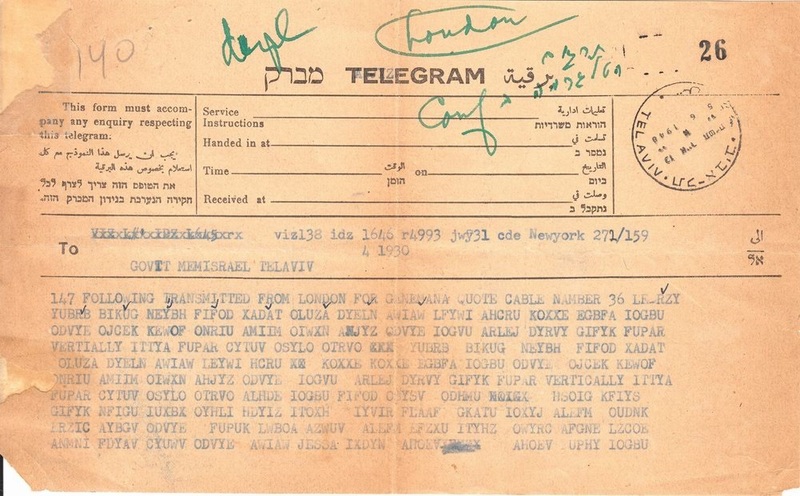 Considering that the state of Israel was proclaimed on May 14, 1948, in Tel Aviv, this telegram was sent in an interesting time to an interesting place. It is well possible that the content of this encrypted message refers to the Arab-Israeli War, which was going on at the time (the Palestine Civil War, which had started in 1947, transformed into the Arab-Israeli War with the Israeli declaration of independence). The ciphertext contains two cleartext words: VERTIALLY and VERTICALLY (the first one probably being misspelled). In the first line the word GANEMANA appears. I wonder what this means. According to the vendor of the telegram, the green writing means “London – Telegram translation in a conference”. This second part contains a few cleartext words, too: FRIEDBERG, BANK, ANGLO, PALESTINE, FRIEDBERGS. Friedberg might refer to the town of Friedberg near Frankfurt, Germany. On the other hand, Friedberg is a German surname. 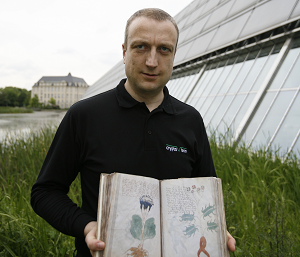 None of these codebooks proved to be the right one. Thanks to Karsten for providing me this interesting cryptogram. Can a reader solve it or say something about the historical background? Comments are very welcome. It is remarkable that certain five-letter codes appear several times, as ITTYA, GIFYK, FUPAR. Frequent words in the codebook? There are a couple of repeated 5-letter groups, which would be unlikely for anything else than code books. Anglo Palestine Bank is the precursor of Bank Leumi, the #2 Israeli bank today. This may be about transfer of funds. Friedbergs – sounds more like a name in the plural form. #2 – in fact yes, it would be very unlikely to find repetitions of 5 letters, aligned to positions which are multiples of 5, in other types of ciphers. This is definitely a codebook, also made more probable with the use of plaintext words in some places (names not in the codebook). “Anglo Palestine bank” was a bank in the founder times of Israel. See Bank Leumi at Wikipedia. Friedberg might be an Israeli working in this bank. “FRIEDBERG(´)S” sounds like the genitive of a person. Is he or she connected to the bank? There is also a 1227P which could be 12:27pm. There are no other numbers, except in the header. Could be the time of transaction of money. But I miss the date. This date could be coded somewhere nearby “1227p”, as “today” or “yesterday”. The text “anglo palestine bank” (nowdays Bank Leumi) and the repeating chunked text is typical of the use of code books which was common for commercial telegrams of the time. “Friedberg” is a city in Germany, not sure if this is relevant in context to this telegram. Definitely looks like code books from the repeated chunked blocks. There is common cipher text between the telegrams. Möglicherweise etwas ähnliches wie der Rudolf-Mosse-Code (der ist es nicht, das habe ich gerade gecheckt). The question is whether a standard book was used or not. The recipient was the Israel government. Therefore it is possible that a special codebook was used. Maybe the sender was the delegate of the provisional government of Israel to the United Nations in New York, Mr. Eban. In June 1948 Mr Eban sent telegrams to Mr. Shertok, the foreign minister of the provisional government in Tel Aviv, which according to footnotes in David Tal’s “War in Palestine 1948” are contained in the book “Documents on the Foreign Policy of Israel, Vol. 1: 14 May – 30 September 1948”. Unfortunately I couldn’t find this book online. On the edition’s website http://www.archives.gov.il/archives/#/Archive/0b0717068001ad6b/File/0b07170684d62daa there is a link to the website of the Israel State Archives. Although there is a “English” button, the documents seem to be only in Hebrew. Is there anyone who can read Hebrew and search the Israel State Archives website for Eban’s telegrams from June1948? At least there maybe hints on the content of the telegram from June 5th. I wonder if there were codebooks containing groups of Latin letters to encrypt Hebrew words/phrases. We know that the codebook did not have a code for “Anglo Palestine bank”. I would expect a dedicated codebook for use by the than new Israel Government to include a code for this. So maybe it makes sense to try more of the known “standard” codebooks of the time? In September 1948 Lieutenant Shula Friedberg of the Israeli Army’s Woman’s Corps visited New York and was received by the Israeli Consul General in New York (http://archive.jta.org/1948/09/16/archive/israel-day-celebrated-at-new-york-citys-golden-anniversary-exposition; https://archive.org/stream/americanjewishti10unse#page/n108). The background was the United Jewish Appeal of 1948 in order to get financial support for Israel in the US. Maybe the telegram had to do with the preparation of the visit of the Israeli delegation. It can be assumed that the Anglo Palestine Bank, which issued the Israeli Pound for the government in 1948 (see the previous page in the link in #17), was involved in the fundraising activities of the United Jewish Appeal. John McVey found the corresponding codebook: “Peterson International Code (3rd edition, 1929)”. John will send me the translation later this week and Klaus will post it here. @Richard van de Wouw: The complete plaintext is not known to me. It would be great if you could provide it.